How long has it been since he lost his name? The torn ruin of his mind no longer knows. Dimly he recalls armor and banners and grim-faced kin riding at his side. He remembers a battle: pain and fear as pale hands ripped him from his saddle. He remembers terror as they threw him into the yawning pit of the Dead God alongside his brothers, to hear the Dirge and be consumed into nothingness. In the darkness below, time left them. Thought left them. Sanity left them. Hunger, however, did not. They turned on each other with split fingernails and shattered teeth. Then it came: distant at first, a fragile note at the edge of perception, joined by another, then another, inescapable and unending. The chorus grew into a living wall of sound pulsing in his mind until no other thought survived. With the Dirge consuming him, he opened his arms to the Dead God and welcomed his obliteration. Yet destruction was not what he'd been chosen for. The Dead God demanded war. In the belly of the great nothing, he was granted a new purpose: to spread the Dirge across the land, to rally the sleepless dead against the living. He was to become the Undying, the herald of the Dead God, to rise and fall and rise again whenever his body failed him. To trudge on through death unending, that the Dirge might never end. 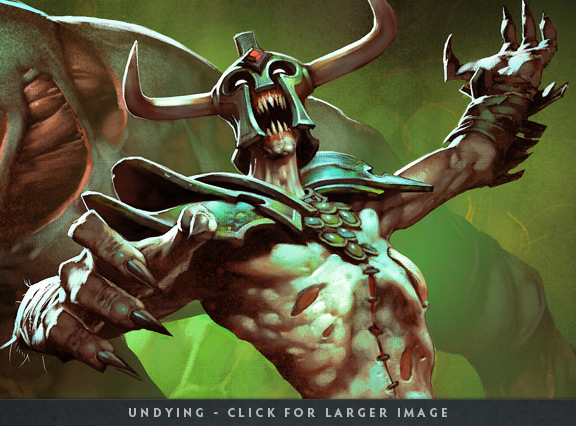 Undying is a Zombie hero that considered a tanker-pusher-nuker-slower. He can raise many small zombies that can slow down enemies and dealing some damages. With his zombies, he can push quickly and destroy towers quickly. 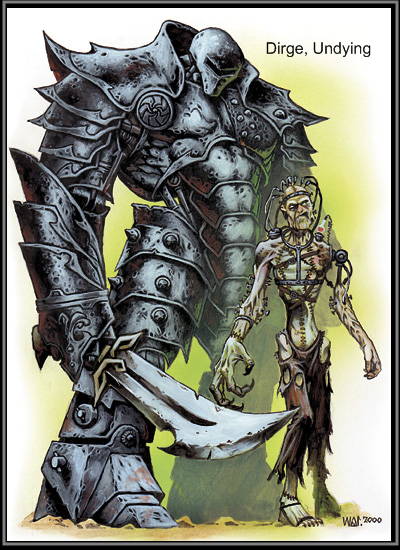 He is also a decent nuker+healer with his skills SoulRip, FleshGolem and Decay. 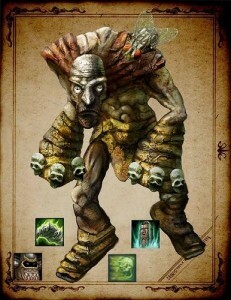 He also can transform into a big golem that slow down enemy and do amplify damages to enemy around him. 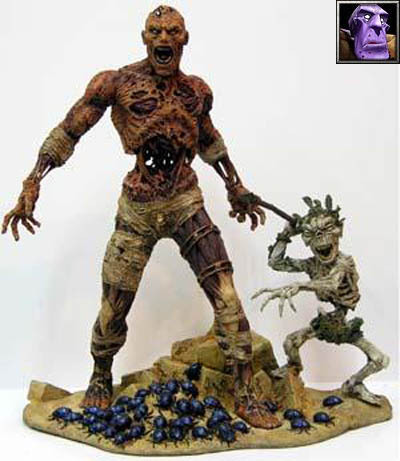 If you are a fan of Zombie Movies, Zombie Apocalypes, Resident Evil etc., this is the right hero for you. Raise the dead and call all the corpse! Decent attack animation for last hitting. Very low agility. Nobody can beat him in the early game Loses his power late game. Good Pushe Must always have teammates nearby to be efficient. Not very item dependent but items benefit him a lot . Hard to farm during early game. Undying saps the life from enemy Heroes in an area, dealing damage and stealing Strength for the duration. The strength of the living is simply borrowed from the strength of the dead. Dealing a small damage in small area while sapping strength. Sapping strength means sapping health and deal damages. This skill is apammable. You need to spam this skill to achieve a decent amount of damage. Try to spam this skill 4 or 5 times to deal the damage you wanted. Redirects the flow of energy through a target friendly or enemy unit, healing or damaging it depending on how many units are near Undying. Each counted unit takes damage. Even his allied Heroes feel despair in Undying's presence. Heal / Damaging a target unit using the life force of the others. Take small health of several units, and give the damage to a single target, as a heal, or as a damage, heal to ally, and damage to enemy. Even allies that are not targetted by this spell, will have their health reduced by small amount. A good skill to harass enemy. Also can be cast to heal an ally and save his life. Summons a tombstone at the target point. Zombies will frequently spawn next to every enemy unit in the area around the Tombstone, and attack them. Zombies have the Deathlust ability, which causes their attacks to slow the target, and if the target reaches below a certain amount of health, increases the attack and movement speed of the zombie. Dirge calls on his fallen brothers to fight for the Dead God. Creates a tombstone that will raise lots of zombies from underground. These zombies will damaging and slowing enemies. Zombies can't be controlled, they attack any enemy they want. A very good skill to make a chaos in a teamfight. Your enemy will face lots of zombies that slowing and dealing damages. And they should run away. Also good to block the creeps behind enemy tower. This will make your creep will freely attack enemy tower because enemy creeps will busy dealing with your zombies. 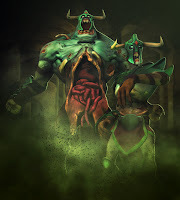 Undying transforms into a horrifying flesh golem that possesses a Plague Aura. This aura slows all enemy units within 750 range and amplifies the damage they take; the closer to Undying, the more damage. When a plagued unit dies, Undying is healed equal to a percentage of that unit's maximum health. Upgradable by Aghanim's Scepter. The flesh of the recently dead add to the power of Dirge's plague. Transform you into a big and powerful Flesh Golem. Will slows nearby enemy and amplify the damage they take. Also will makes you gain HP for every units dies around you. Very good to make more chaos in a teamfight. Your presence will make enemy to fear. You will amplify their damage and make them more fragile. A nice skill as a zombie. This build focused on nuking enemy down in early-mid game, your main skill here are Rip and Decay. Why maxed Decay first? Well Decay looks like a crap skill for first sight. But, spam this skill and your enemy will distraught and will retreat and can't fight anymore. Why maxed Soulrip before Tombstone? This is a nuker build, so SoulRip and Decay will make a good combo. And also SoulRip will helps your team survive with it's heal. This build focused on fast pushing, and can destroy 1-2 towers on the earliest stage of the game. Why maxed Tombstone first? To push, this is your main skill, your Zombies will helps your team to blocks enemy creeps so that they can't defend their tower and your creeps can attack tower freely, and will makes your team gets a fast early tower. Why maxed Soulrip before Decay? 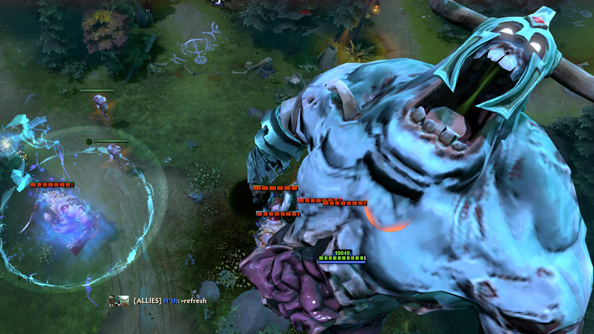 Soulrip also helps in pushing strat because it will deal damage to creeps and helps you destroy creeps wave quickly. And also SoulRip will helps your team survive with it's heal. In the early game your part for the team depends on you and your team. Whether you want to be an annoying nuker, or a fast pusher. You have the ability to do both of those part for your team. If you want to be a nuker. you should maxing Decay and Soul Rip first, those 2 skils are your main nukes for early-mid game. Spam those 2 skills for enemy heroes and makes them uncomfortable in lane. Makes their HP become low or even kill them and get firstblood or something. And if you want to be a pusher, you should maxed your Tombstone that can be use to block enemy creeps. Undying is one of the best creep blocker, just like Axe. With his Tombstone, enemy creeps can't go forward to defend their tower. And that makes your creeps and your team can destroy towers so fast. A trilane with Undying will guarantee 1 or 2 towers in the earliest of the game. Although you are a Strength type hero, you should always have mana for your skills. You need to buy +mana items like Arcane Boots for your foots. In mid game you should already have Flesh Golem ability. And you can use that to fight against enemies. While there are your zombies fighting with you, you will become more powerful. And also don't forget to spam decay and soul rip. Soul Rip that target foe will do damage and Soul Rip that target ally will heal. Because you have a high pushing power, you can keep focusing on pushing and destrowing tower and another tower. You can also buy mekansm that will heal nearby allies, and also your zombies. Or, if you want to have more pushing power, you need to buy Necro Book. Because your skills are already not painful in late game, your part here is to tank the damage and rely on your Flesh Golem form to amplify damages. And you shoukd keep slowing opponents using your Zombies and your FleshGolem Aura. You also need your supportive items like Mekans to heal allies, Pipe to tank magical damage, or Necro Book to help team deal damages in teamfights. You can also buy a Blade Mail to reflect enemy's damage. Using this hero, you should be brave and keep moving forward destroying enemy heroes with your scary face and big body. You need the combination of these items. Like: 2 branches, 1 tango, 1 clarity, 1 ward, 1 ring. Ward is optional, if there is already one of your friend that buys it, don't buy. Active: Replenish Mana - Restores mana in an area around the hero. Flat movement speed bonuses from multiple pairs of boots do not stack. Why Arcane Boots? You have spammable skills, so you need more mana, with this item, your mana will be fulfilled. And also to replenish mana of the team. Active: Restore - Heals 250 HP and gives +2 armor in an area. Passive: Mekansm Aura - Bonus HP Regen in an area. Why Mekansm? Heal for all allies in AoE, is a must for teamfights. Active: Barrier - Gives nearby friendly units a shield that blocks 400 spell damage. Multiple instances of spell resistance from items do not stack. Why Pipe of Insight? Gives barrier for all allies in AoE that Block 400 spell damage, very useful. Active: Arctic Blast - Emits a freezing wave that does 200 damage to enemies and slows their movement by -40% for 4.0 seconds. Passive: Freezing Aura - Reduces attack speed on enemies. Multiple instances of Freezing Aura do not stack. Active: Toggles Burn Damage on or off. Why Radiance? Helps yo to deal some constant damage in teamfights. Also helps in farming creeps. Crystal maiden have an unlimited mana and a great lane partner. Whatch Purge playing using Undying here, seems fun! Never heard of this? Well see this!